Use the magnifier that is best for you. 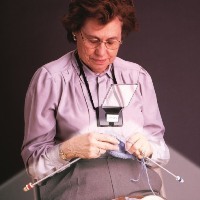 Or use the light without magnifiers attached. 20 Percent Discount on 2 or more lights. Minimum order $10.00. US Orders: $6.00 first item, $3.00 each additional item. International Orders: USD 6.00 per order plus international postage. This limited warranty does not cover defects created by improper usage, including the use of wrong voltage, and does not cover bulbs or parts that become defective due to mishandling. This warranty is limited to replacement or repair of the original unit. It is made only to the original purchaser and is effective only within 120 days upon presentation of a provable date of purchase.